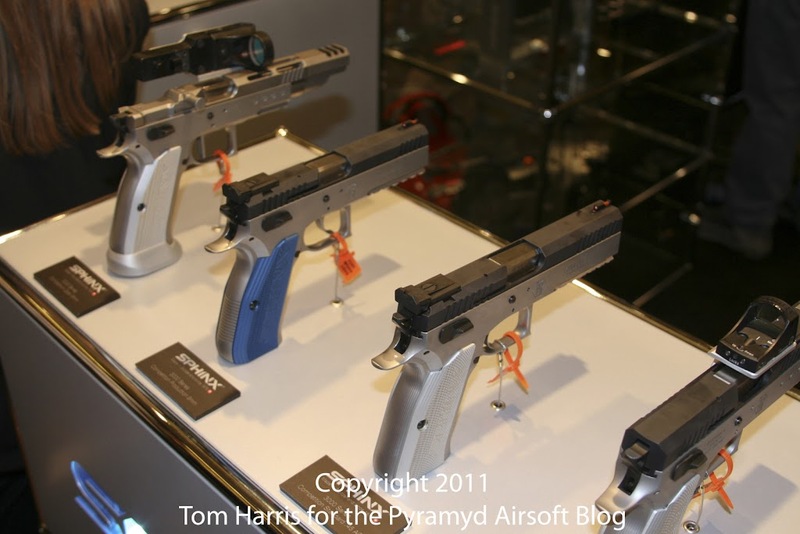 Yeeeaaaaa...soooo...I really had no idea what I was getting myself into when I decided to stop by the KRISS booth at this year's Shot Show 2011. First off, I was greeted by the gentleman you see eyeballing me at the bottom of the image, hiding behind my watermark. That's Wolfgang. He's a nice guy with an awesome German accent. You see, the Swiss don't actually speak "Swiss." They speak German, French and/or possibly one other language, depending on their closest bordering country. 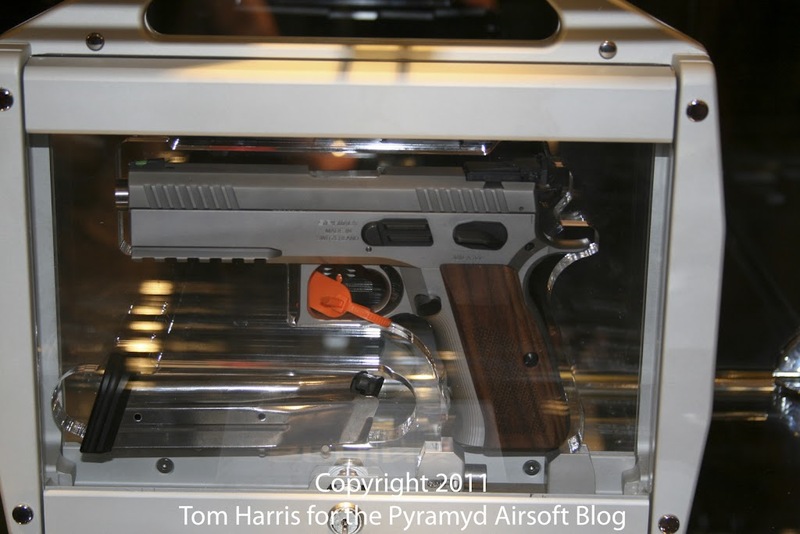 I think I may have already mentioned him in a previous Shot Show blog, most likely having to do with KWA stuff. Wolfgang spotted me like a hawk stalking an oblivious rodent scurrying through an open field from several hundred yards above the Earth. When I moved in closer to the booth to get a better look at some incredible pistols that caught my eye, he swooped in and struck with the kind of precision you'd expect from someone living in the land of Haute Horlogerie (Google it). How about this Swiss minx? To the naked eye, this Sphinx race pistol might just look a little boxy with a Doctor-style sight mounted to its lower frame, but NO!!! 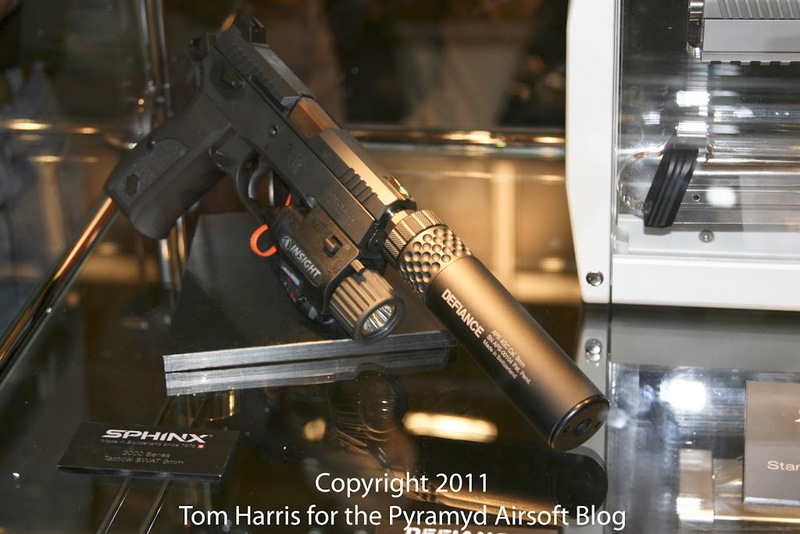 Sphinx ported the slide & barrel and added a nice little compensator in there for good measure. My favorite combo in a race gun. 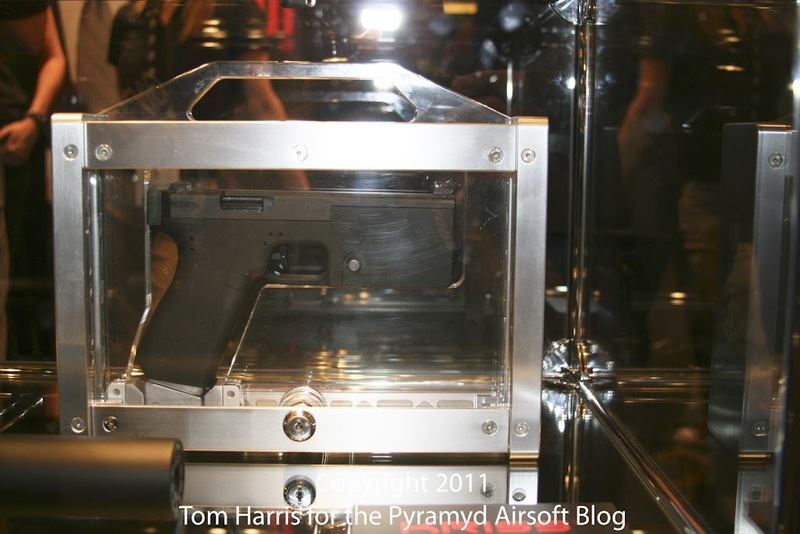 I have good reason to believe these features are designed to reduce the recoil and increasing the shooter's ability to keep the muzzle from jumping too far off target, for faster target-acquisition between shots. But who cares about the purpose for having those features?!?! I just love the way they look: "Sick wit it," as they say in some circles. 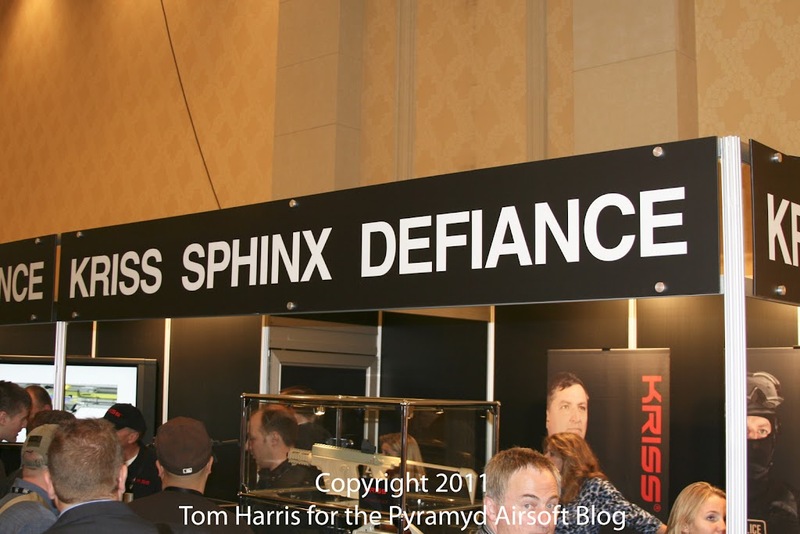 Can you imagine how legitimately sweet it would be if somebody in the Airsoft world were to make a Sphinx Airsoft replica like this, or at least the parts to build one from scratch? Also: am I particularly interested in hearing about how the gentleman in the photo is using the trigger to suspend the gun while it's pointed directly at his torso? No. But will I allow you to comment on it in the "comments" section below? ABSOLUTELY!!! Have at it. But back to the race guns...Are you more of a traditional Open Class kinda guy or gal? Sphinx has something for you, too. This one's all decked out with the slide-mounted charging handle, competition magwell, slide & barrel ports (of course) and compensator. 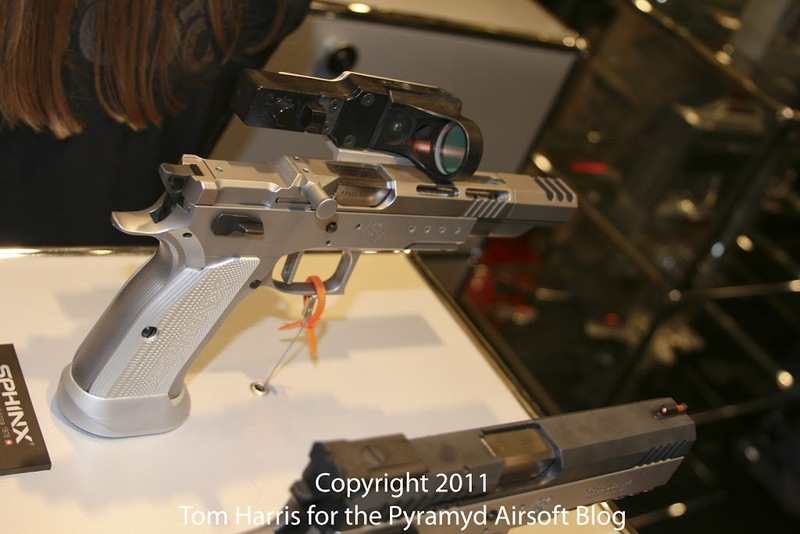 To the more observant members of the crowd, you'll notice that this particular gun features a C-More-style optic (probably the real one in this pic), but it's got a weird mount that makes the optic perpendicular (rotated 90 degrees) to the orientation a traditional optics mount would have. This is done so that the actual electro-optical dot image projected on the glass will be aligned as close to the barrel as possible, to provide more accuracy for the shooter (in theory). Can't say I bothered to even look at the name tag for this next situation, so for all practical purposes, we'll just call it "Silver Sphinx Pistol in a Glass Case of Emotion." I'm not saying that I don't think it's a good-looking gun. I DID take its photo, didn't I? 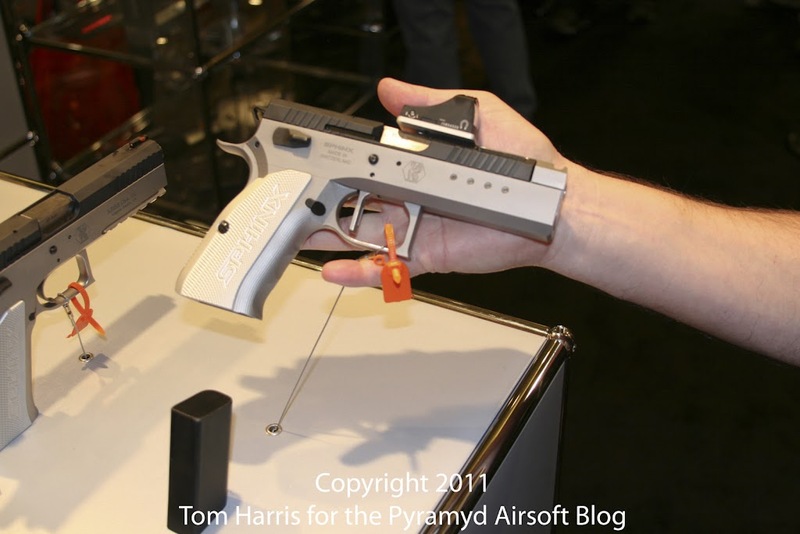 It looks like Sphinx took a Glock and like, did stuff to it or something. There was so much to discuss and so little time...sorry I couldn't provide more info here. At least I got the photo (sort of, stupid flash!) Someday, I'm going to learn how to bump the ISO up to a more suitable level like a big boi and avoid having to use the flash at all for future Shot Shows that I attend. Yes. That's the same Sphinx, or one very similar, to the model that KWA is working on producing for the 6mm world. Only this one has attached to it, aside from a nice little Insight taclight, a Defiance suppressor specially designed for this gun. It's no ordinary suppressor and when I tell you about what it does, you wouldn't be the only one if you were to say, "that's definitely made for some black ops mother lovers." As much as I love California and the fact that all my family & most of my friend reside here, this new Defiance suppressor is making me seriously question whether some other state not nearly as lame about suppressor laws would be the way to go. Why would I need a suppressor for a firearm? I'm an accountant. Nuff said. You never know when haters gonna hate on your financial statements and you gotta "hot" some fool for disrespecting your Profit & Loss Statement. Enough bibble babble. 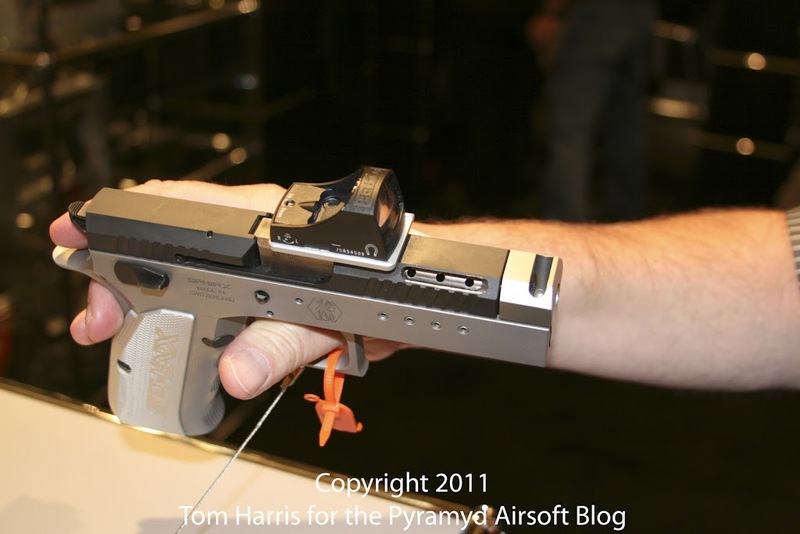 The Sphinx Tactical SWAT 9mm is a semi-auto pistol. However, with the Defiance suppressor attached, you can toggle between semi-auto and single-shot. You might ask, "Well, what's so great about that?!?" ANSWER: The Defiance suppressor somehow deactivates the slide from cycling on single-shot so that when you fire the gun, the spent shell is prevented from ejecting, and thereby further reducing the decibel level at which this Sphinx beauty registers at when fired. The down side is that you have to manually rack the slide after each slide on single-shot, but the trade-off is so cool, that I don't think it really matters. I love how I'm providing opinions and analysis on matters of clandestine tactics & covert operations. As an Airsoft blogger, I'm like totally qualified for that sort of thing. Totally. Anyway, next up, I'll show you some photos of the REAL KRISS submachine gun. Then I'll get back to Airsoft. I'm also working on my AAR of Operation: Red Storm that went down in Whittier, CA two weekends ago. Thanks for reading (or at least scrolling through the pictures).